Media and digital content has become an integral part of our lives. Digital content has expanded the opportunities for accessing information for individuals with special needs and classrooms with culturally diverse students. Because the digital content is taught through multiple modes, it provides access to information previously available only through print formats. By incorporating universal design into the classroom, the students are using media and digital literacy skills, preparing them for the global world in which they live. In this chapter, a description of universal design will be provided, how to use the digital and media content to create a classroom that honors diversity, and how to use universal design for teaching different languages. The concepts of universal design and the global classroom are pulled together through project or problem-based learning. Finally, a glimpse into the future classroom technology is provided. Friedman (2005) in his book describes ten technology innovations that flatten world. The massive investment in fiber connections, followed by the bursting of the technology bubble, bridged the way for an inexpensive communication infrastructure connecting the continents of the world. These connections allowed us to begin to work and to collaborate in ways that were not possible before by instantly sharing information globally (Friedman, 2005). As the world flatten, the reliance on technology for communication, collaboration, and sharing increased. By 2014, 90% of American adults owed cell phones, of which 58% of those were smartphones. Tablet computers are frequently used, with 42% of adults owning these devices (Pew Research Center, 2014). The Pew study also reported that the usage of smartphones extended beyond telephone conversations. The devices were being used for retrieving information, listening to music, using the global positioning system (GPS) for information related to location, and interacting with social media. For individuals with disabilities, the digital revolution which started as the world became flat was instrumental in opening up the possibilities to the world. First, the information they were able to access increased. Secondly, they were able to gain independence in acquiring that information. With the increasing number of assistive technology tools and better utilization of the digital tools, educators wondered if they were able to support more of the students in their classes in accomplishing educational goals. To answer this question, CAST, the Center for Applied Special Technology, developed Universal Design for Learning (UDL). CAST was founded in as a not-for-profit organization to explore uses for technology in expanding opportunities to access the general curriculum for all people, especially those with disabilities. Universal design for learning (UDL) examines ways to use technology to increase the opportunities for students in accessing the information available to them and reaching the educational goals of the instructor or teacher. Digital literacy skills are necessary in making the guidelines that are outlined in the UDL model work well for children which have special learning needs. First the digital literacy skills will be described. Then the principles of universal design will be discussed with examples of how the two approaches come together. The different types of assistive technology will be discussed that are used to support individuals with disabilities and non-English learners. Finally, project-based learning brings the principles outlined in the universal design together with the digital literacy skills create powerful learning environments. With available technology tools, digital media is readily accessible from the palm of the hand. The increased availability of inexpensive, smaller devices allows classrooms to participate within the global community. Digital media introduces students to a variety of ways for interaction with the easily interchangeable and transformable material for creation of new content. Because of the flexibility of digital media, students with special needs are able to access information that once was difficult for them to use in paper-based formats. Not only has access improved, students with disabilities can interact independently with the information. Digital literacy is becoming an essential skill for all students as more media options are available in digital formats. Digital literacy is the students’ ability to use media in a digital format to access information, evaluate, and analyze that information, then create and share new products to communicate (Heick, 2014; Media Smarts, ND; US Digital Literacy, 2014). Becoming experts in the use of digital literacy skills opens the door to other forms of literacy that are essential for students: civic literacy, health literacy, environmental literacy, information literacy, and media literacy (Partnership for 21st Century Skills, 2011). 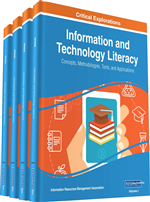 By using digital media skills, students are able to utilize forms of literacy for non-text based instructional material increasing the options available for them to learn. However, digital literacy skills for students with a disability or who are non-English speaking enable them to access instructional material and global information by providing alternatives to paper-based text (Rose, Meyer & Hitchcock, 2005). Below is an expanded explanation of the following subsets of digital literacy skills: (a) accessing digital media, (b) evaluating and analyzing digital media, (c) producing media, and (d) creating and sharing media (Digital Literacy, 2014; Heick, 2014; Media Smarts, ND).